One the of the nice things about the era of Macintosh models that begins with the Bondi Blue iMac is that Apple tries to keep current the software that manages your Macintosh, called "firmware." Apple made this possible when it switched from using read only memory chips on the motherboard that have code permanently embedded in them, to chips that can have their code updated after the computer leaves the factory. Keep in mind that firmware, the software that manages your computer, is different from the operating system software [Mac OS 9 or X] that runs on your Macintosh. The chips that make firmware updates work are known as Flash read-only memory chips [Flash ROM]. Flash ROM makes it possible for Apple, or any company that incorporates such chips in their equipment, to update the software that resides inside those chips. The updates are known as Firmware Updates and come as small applications that you download and install. Flash ROM in modems makes it possible for you to update your modem to take advantage of newer standards in data transmission or eliminate flaws discovered in the code originally embedded in that device. Flash ROM in a modern Macintosh means that it is possible for Apple to address issues it finds with a computer's on-board code. Apple releases what it calls firmware updates – software to be loaded into flash memory chips on the motherboard of your computer and onto special chips of peripherals like the modem and CD/DVD drive. These updates address problems found in the code used when your computer was first released; they enable older machines to recognize new features found in more current versions of the operating system; and they enable Apple to incorporate newer industry standards for such input sources as USB and FireWire. Now as nice as Apple is by releasing updates to the original firmware installed in those chips, they can't make you install those updates. This article is our attempt to cajole you to update the firmware in whatever model of Apple device you are using, be it one of the original iMacs or an iPod. There is a firmware update looking for a home in your Apple gadget. And, just in case you need a nudge, I will tell you a nice icky story of what happens when someone skips a few steps while updating their operating system from Mac OS 8 or 9 to Mac OS X. The step skipped was the installation of the firmware update. http://docs.info.apple.com/article.html?artnum=58174. You will find a complete listing of all updates for all models. Pick those that apply to your machine and install them first. What is the version number of my firmware? Apple System Profiler displays your firmware’s version number. To view the revision information, choose "Apple System Profiler" from the Apple Menu. On the System Profile tab under the Production Information, read the number after "Boot ROM version." If your computer appears somewhere on that list, there is a firmware update for you to install. It must be installed before you install Mac OS X. That's understandable – which is why there is a Tuesday Night Clinic. Whether it is firmware to update your Mac or your iPod, they are happy to walk you through the process or, if you bring your machine in, do it for, or with, you. If you install Mac OS X before you install the firmware updates for your Macintosh, you most likely will lose video. The computer sounds like it is running, but you can see nothing on the screen. You are in trouble. Unfortunately the documentation for Mac OS X 10.3 (Panther) and the Read Me file on the installation CD do not make this clear. The wording in the ReadMe file has led some to believe that it is safe to run the Mac OS X installer as a way of finding out if you need to upgrade the firmware. Don't believe it. The firmware update for your Macintosh includes a change in the software to account for the way Mac OS X composes the video you see on the screen. The new code makes adjustment to the built-in Power Analog Video (PAV) card in your computer. The PAV card drives what you see on the picture tube. You are especially in trouble if you own the first generation slot-loading iMac. You installed Mac OS X before installing the firmware update; now can't see anything. You need to install the firmware updates you neglected to do first – but, because you can't see anything, you can't install anything. Your one hope is to try and bypass the display video circuits in your computer and move that video to a monitor other than the one in your now blind iMac. You can't: your model does not have the ability to deliver external video. You now have a fancy paperweight. The standard answers for the person owning a first generation slot-loader are akin to taking Laetrile. The Tuesday Night Clinic crew found a better answer - one that even works. They do not like the idea of an iMac sitting on paper. 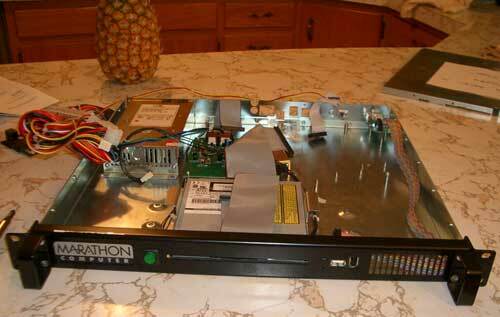 The Marathon Computer Company produces a line of rack mounting adapters that makes it possible to install a modern Macintosh in a standard commercial data rack enclosure. You can view their full line of adapters at: http://www.marathoncomputer.com/. For the iMac, they make two models of interest to us: one for the older tray-loading iMac and one for slot-loaders. You supply the CD, hard drive, motherboard and a monitor. Marathon supplies the rest. The Pi's night owl clinicians were fortunate to have access to an iRack as part of a test program. So, reasoned these feathered experimenters, if the iRack will supply external video, why not use it to restore video to a now blind iMac? That is what they did, and it works. The theory behind all this is that some facet of the video display in Mac OS X is different from the standard rates in prior versions of the Macintosh operating system. Thus, without reprogramming the video circuitry to understand these new video rules [a firmware update], the screen goes blank. To repair the damage, we need to do two things: (1) gain access to the video external to the iMac to see what is going on; and, (2) boot the machine into Mac OS 9 so that we can install the firmware update. Firmware cannot be updated from within Mac OS X. Do keep in mind that this is a methodology to restore video to an otherwise working iMac; it will not undo other woes. The Clinic crew removed the motherboard from the slot-load iMac and connected it to the iRack. They then removed the hard drive and CD drive from the iMac and installed them in the Marathon box. A multi-synch monitor was attached to the Marathon video connector. The Mac OS 9.1 or later install CD has the firmware patch on it. 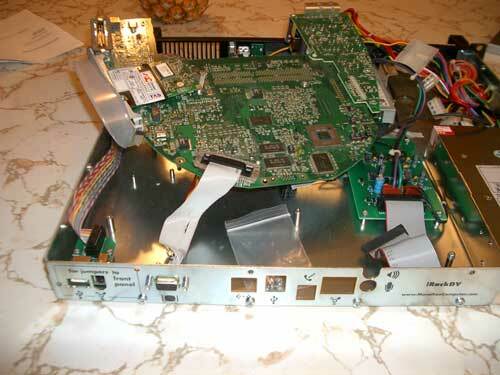 The crew booted the iMac motherboard now installed in the iRack from the CD. Because the motherboard is now running under Mac OS 9 into the external monitor, we can see video. Now it is possible to perform not only the firmware updates, but install software or perform other diagnostics. The firmware updates is applied following the instructions on the CD. The crew then performs assorted tests to make sure all is well. It is now possible to put all those pieces back in the iMac and have it display video on its built-in monitor. Amazing what a bunch of night owl technicians can conjure up. Why? After all I have written, you should be more interested in installing the firmware updates that apply to your computer or iPod. What the technical wizards did that Tuesday night was made possible only because they had access to a Marathon iRack box. They are pricy and not something that one has lying around the house. If you are interested in doing this, you must be comfortable taking apart your computer, have a working multi-sync monitor and access to an iRack. Be neat; always note what secures what where. Remember, not all screws fit in all holes. 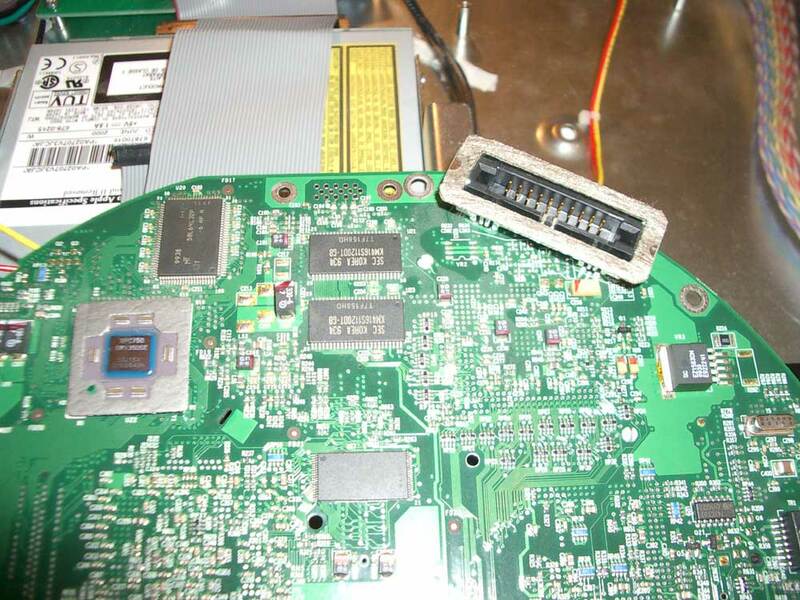 The Marathon folks have a very complete iMac disassembly PDF on their website. And when you get discouraged, the clinic crew will repair and reassemble your iMac in trade for that iRack you bought. Installing the firmware first is so much simpler.